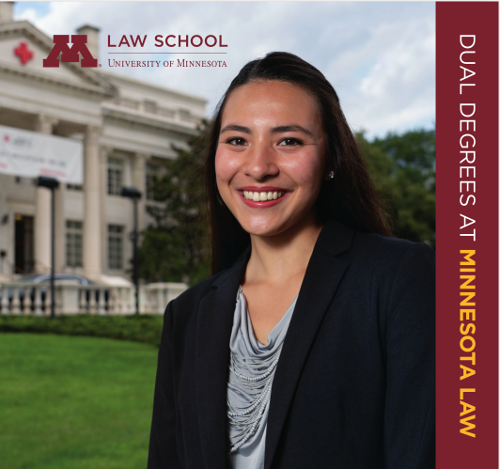 A student interested in pursuing a dual degree must apply separately to both the Law School and the partner program. Admissions decisions are made independently by each program. Students are encouraged to apply to the JD program and partner program simultaneously. However, students may also apply to a second degree program during their first year of law school. How do scholarships and financial aid work? Generally, support offers are made at the time of admission from each program independently. Students must maintain at least half-time enrollment status in at least one of their degree programs to be eligible for any federal financial aid. Courtney West, J.D./M.B.A. ’14 has worked for the last three years in Corporate Strategy & Business Development at Land O’Lakes Inc., one of the country’s premier agribusiness and food companies. Why did you pursue a dual degree? I came into the program with a love of learning and a pretty clear idea of what I wanted and where I could find it. Some of the skills I needed to be successful could be taught in the Law School, others in the business school, and pulling from both programs was what was going to make my graduate experience the best it could be. What is the value of a dual degree? In the real world, no function—medicine, law, business, public policy, etc.—exists in a vacuum, and the dual degree program lets you get a jump-start on piecing it all together. How has having a dual degree helped you? In a practical way, the dual degree helps me bring a new level of credibility to the table when working with professionals from one industry or another. The dual degree also helped me understand how two worlds intersect and build off of one another. Just like everyone brings past experiences and education to the table, I’ve built dimensions to my perspective over time with the dual degree. Would you recommend a dual degree to somebody contemplating one? I have never regretted the dual degree and can say it has only helped me in my career, but it was also a lot of time and energy. I think that anyone considering a dual degree who is up for the challenge and is sure that it’s the right choice for him/her and his/her career aspirations should absolutely look into it.